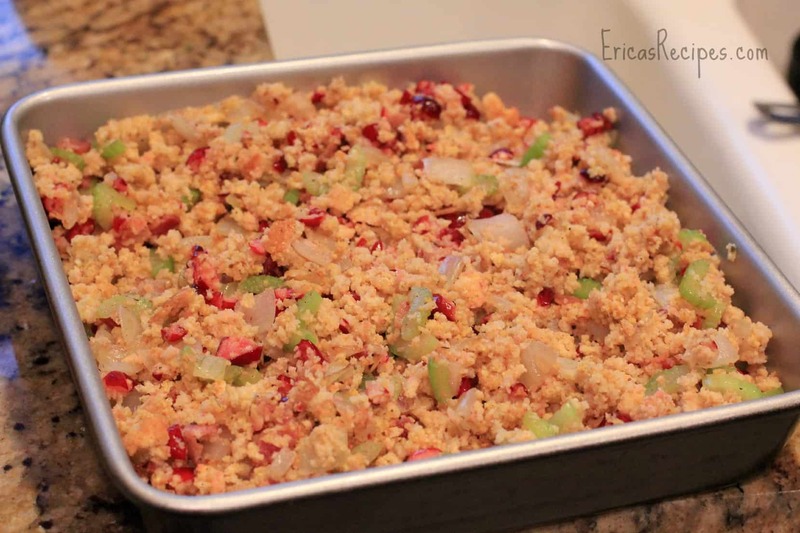 Cranberry & Bacon Cornbread Stuffing is a neat twist on dressing with sweet and tart cranberries and salty bacon. For the past week, since my grocery store here in Florida finally got in fresh cranberries, I’ve been going nuts over these tart little beauties. I absolutely love cranberries, and I appear to be on a mission to see how many different ways I can use them. So tonight, I stuck them in some stuffing. When all was done, I quickly saw this clearly needed some kind of gravy, as all stuffings do, and in the absence of another option at the time, I whipped up a Cream Gravy. The bacon is obviously a bonus. In a large skillet, cook the bacon over medium-high heat until crisp. Using a slotted spoon, transfer the bacon to a plate lined with paper towels leaving the bacon fat in the skillet. Pour off bacon fat leaving ~3-4T in the pan. Add the onions and celery to the skillet. Season with salt to help the veggies soften and cook 5 minutes stirring often. 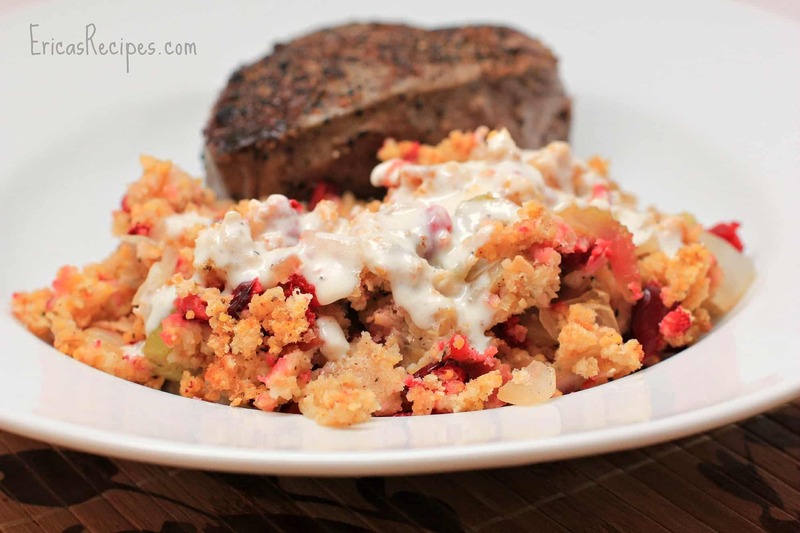 Add the bacon and veggies to a large mixing bowl. Toss with the remaining ingredients adding more or less Chicken Stock as necessary to moisten the stuffing. Transfer to a baking dish, cover, and bake 30 minutes at 350F until heated through. To make the gravy: In a small saucepan over medium heat, heat the butter and flour whisking until smooth. Cook 2 minutes. Slowly add the half and half, whisking constantly. Cook, stirring constantly, 5-6 minutes over medium-high heat until thickened. Remove from the heat, and add salt and pepper. Serve the stuffing with Cream Gravy spooned over.